Iowa City, Iowa—ACT® Academy™ is now open at act.org/academy. The free, online learning platform is designed to help students around the world pinpoint areas of academic weakness, improve their ACT scores and master the core skills they need to prepare for success in college and career. 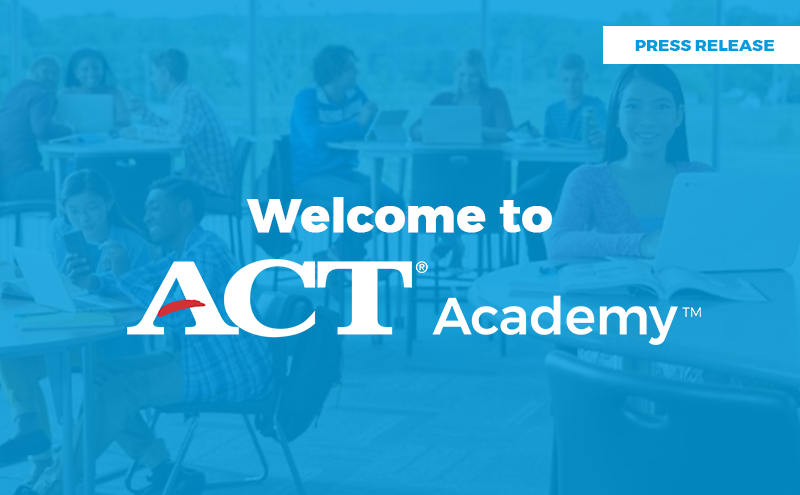 ACT, the nonprofit best known for offering the ACT® test, the leading college readiness exam in the US, created ACT Academy to help students improve their academic skills by giving them access to the world’s leading collection of online learning resources. ACT Academy is able to deliver an individualized learning plan tailored to each student’s particular academic needs. ACT Academy content draws from extensive resources that include learning materials from NASA, PBS (America’s Public Broadcasting Service), GeoGebra and other learning organizations such as Khan Academy, as well as ACT’s proven tips and strategies—and delivers them in one convenient place. ACT Academy resources go beyond traditional lecture-oriented teaching videos. Selections include educational games, short skill tests, interactive apps, video lessons, full-length ACT practice tests and other engaging learning approaches, validated through professional educators. Best of all, each student receives a personalized study plan, based on ACT Academy’s diagnostics or scores on the ACT test, PreACT® or an official ACT practice test. This enables them to drill down to improve their skills using materials that are proven for success and conveniently available to access whenever they want. ACT Academy is compatible with all devices, allowing students to work on building their skills anytime, anywhere they have internet access. Parents, teachers and counselors can use ACT Academy as a contemporary approach to help today’s digitally savvy students study, practice and learn. This summer, ACT will introduce additional features for parents, teachers and counselors use who can use ACT Academy to gain insight into what their students are doing, follow their progress and assign additional resources for extra practice.